4 plays, 4 playwrights, 26 actors. 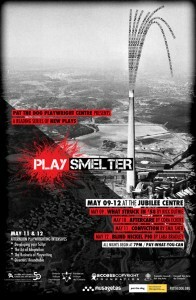 PlaySmelter is a reading series of new work, written on, inspired by, or grounded in the black rocks of Sudbury. In May 2013, we rolled up our sleeves and plunged into these raw materials, putting the text to the test. This reading series was the first of its kind in Sudbury, and we were thrilled to showcase the emerging voices of Lara Bradley, Cora Eckert, Rick Duthie, and award-winning playwright Emil Sher. PlaySmelter returns to Sudbury in May 2014, where we’ll once again throw open the factory doors and let you experience more raw works of theatre in all their gory glory. Pat The Dog from Pat the Dog Playwright Centre on Vimeo.